Have you ever been in a situation where you need to choose the format to encode your videos in? That is all too common if you record or edit videos – even casually on your mobile devices. If you plan on uploading your video to an online platform, you should check what format is recommended. Most online platforms prefer certain formats and by checking you can find out what they are as well as any other specifications that may be relevant. The majority of online platforms nowadays recommend MP4 with H.264. For example YouTube’s recommended settings call for it too. Technically HTML5 videos can be published in any format, but browsers only support MP4 with H.264, WebM, and Ogg. Of the three MP4 with H.264 is the only one supported by all browsers including Safari. The others can be used, but if MP4 isn’t used as a fallback some viewers may have issues watching the video. When distributing video files directly your focus should be on selecting a format that most recipients will have no problem viewing. Nowadays the best format for that is MP4 with H.264, which is estimated to be supported by 98% of devices. To burn a video DVD your video needs to be encoded in MPEG-2. More importantly it also needs to follow other DVD specifications regarding the resolution, frame rate, and so on. If you want to optimize the video for a specific device, you can attempt to find the supported format that has the best compression. As things stand you will want to check for support for HEVC specifically, or VP9. When you’re editing videos the ‘best’ format to use is RAW video that is uncompressed. However that is difficult to work with and requires a professional set up. In a more practical sense the ‘best’ format is whatever format the video was originally encoded in when it was recorded. That should cover most of the common ways in which you may need to use videos – and the best formats for them. 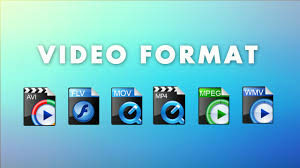 If necessary you can always convert the video format, and for example you could use Online Video Converter and follow the steps at https://www.videoconverter.com/how-to-convert-avchd-to-mp4.html. Although basing your decision on how the video will be used can make it easier to select a video format, you should remember that new formats may replace some of the ones listed above. To ensure that you are aware of the best formats to use, you need to keep yourself updated – especially on popular new formats.